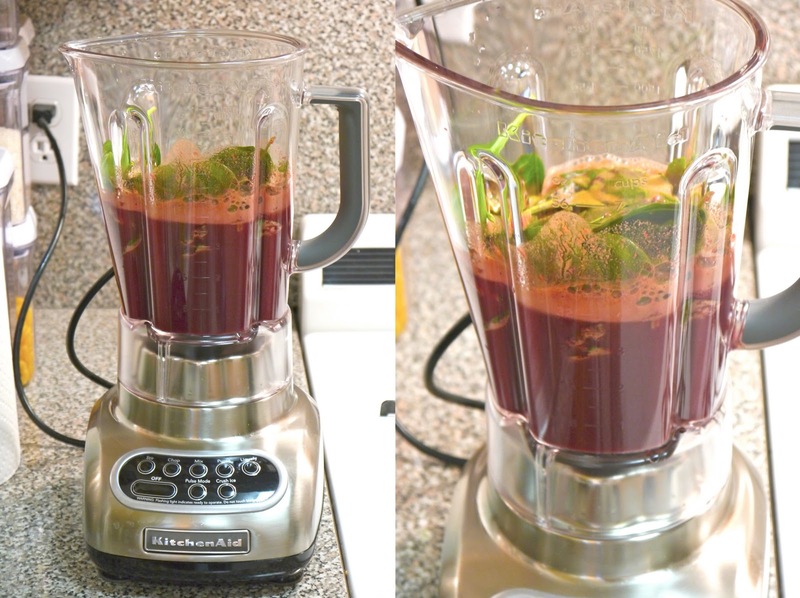 This is my juicer, as you may have seen in my juicing video. 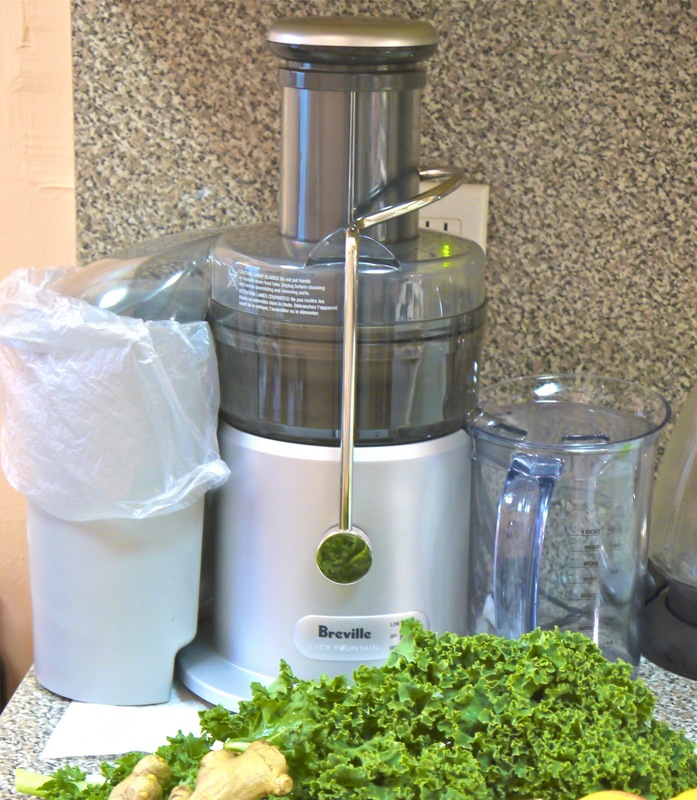 It is the Breville Juice Fountain Plus and works really well. Today I decided to do something different! I was watching itsjudyslife the other day on youtube, and her husband made a juice similar to this one. 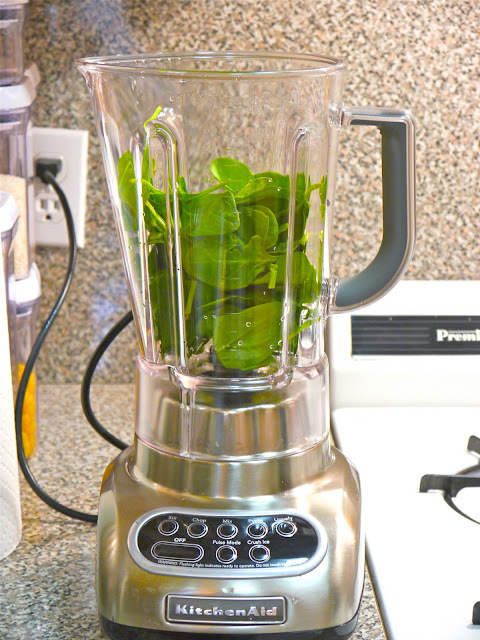 But before drinking it, he puts the juice in a blender with spinach. The spinach totally liquifies! This is great because you also get your fiber since you're not only extracting the juice. Plus spinach is amazing for you! Here is the juice after putting all those veggies and fruits down the juicer. Now its time to add this to the blender. Oh my gosh, I've been really into juicing things lately as well! I don't know if you have Netflix, but if you do, you should check out the movie Fat, Sick, & Nearly Dead! It's a documentary on this guy who decided to go on a juice diet for 60 days due to health issues and it was what inspired me to go out and invest in a Breville juicer as well hehe! I am going to try this!! Looks so good!!! DO you use organic fruits and veggies? I started juicing because of you! I got the same juicer for Christmas and I just LOVE it!! Thank you for doing what you do best! I've become obsessed with kale. I always throw kale and spinach into my berry smoothies, along with some vegan yogurt or almond milk and flax seeds that I grind up... adds a bit of thickness not to mention the nutritional value is through the roof. I love your videos and blog posts! Keep it up! Hey Annie I know you're a busy gal so you probably won't get to this, but I was just wondering, how heavy is your juicer? (I know that probably sounds like a ridiculous question). I've been using my parents' juicer which is really hurting my back every time I lift it out of the cupboards. Do you think the juicer you have is a reasonable weight? I want to see if my parents will get me the one you have for my birthday :) Thanks!